"National Rifle Association (NRA) CEO Wayne LaPierre once famously told a CPAC gathering that 'the guys with the guns make the rules.' 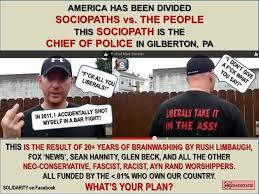 In the town of Gilberton, Pennsylvania, he might have finally found the perfect test case for his insane vision of America. "This is no idle threat the chief is making. Kessler is the head of a private militia called the Constitution Security Force (CSF) whose members swear an oath to 'respond to the call if... needed to resist tyranny that seeks to destroy our republic.' Kessler recruits CSF members at his website ChiefKessler.com, combining his personal and professional identities in one neat little package. 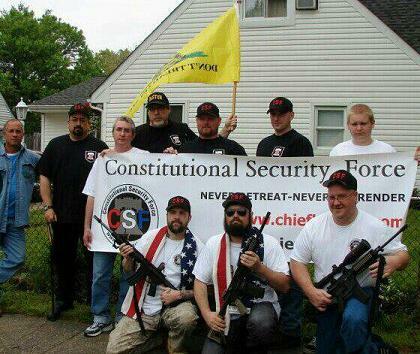 "CSF openly affiliates with anti-government extremist groups like Oath Keepers and the 'Three Percent' movement, which was founded by former Alabama militia leader Mike Vanderboegh. Vanderboegh made his own headlines in 2010 when he urged supporters to throw bricks through the windows of Democratic offices nationwide following Congress' passage of health care reform. Many offices were vandalized in response, including that of then-Congresswoman Gabby Giffords. "In 2009, I co-authored a book called Guns, Democracy and the Insurrectionist Idea. In the book, Casey Anderson and I exposed the threat of insurrectionists -- those who believe that they have an individual right under the Second Amendment to shoot and kill elected officials, police officers and military service members in response to what they see as 'tyranny.' We warned the nation that insurrectionism was anathema to our democratic society and, if allowed to spread, could lead to serious violence. "Some thought our warnings were overblown or alarmist. Even as Congressional offices were vandalized and Gabby Giffords was shot during an assassination attempt, the conventional wisdom held that we were too advanced as a country to succumb to political violence. But now -- out of the same state where rebellious farmers launched the Whisky Rebellion in 1791 -- we have seen the true face of 'Second Amendment remedies.' A one-man police force and his private militia -- accountable not to the local government, but to him -- appear to have taken over the small town of Gilberton. "Too many of our leaders have indulged insurrectionists as if they were bullying in-laws -- unpleasant but not really dangerous. Mark Kessler has shown us a grimmer reality: How democracy is compromised when access to the political process is blocked through brute intimidation and dissenters become an endangered species. Thanks to the gun lobby and its minions, armed political violence is no longer just something we see in the news in some far away third world country, but a contagion that is beginning to inflict our culture right here in the United States. 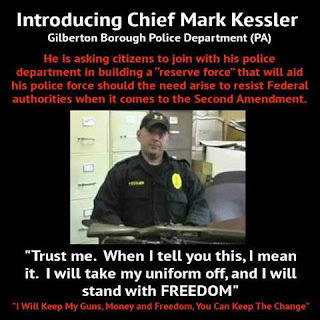 "[My organization, the Coalition to Stop Gun Violence, has launched a petition with CeaseFirePA calling on the Gilberton Borough Council to fire Chief Kessler immediately. 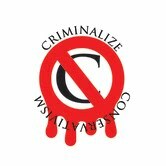 You can sign it here.]" 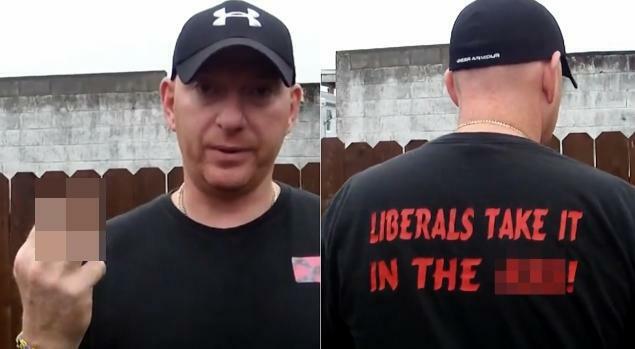 "In a video that has received wide attention, police chief Mark Kessler repeatedly tells those upset by his use of profanity to 'go f*ck yourself' as he fires various automatic weapons. "Kessler has uploaded several profanity-laced videos to YouTube. 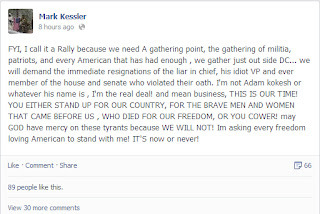 In one video, Kessler berates 'libtards' and warns of an armed rebellion against the government. 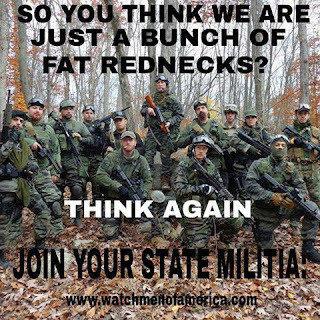 "'I’m calling on all true Americans , all militia members, all true oath keepers to assemble, be ready to march on a tyrannical county government right here in Schuylkill county Pennsylvania, democrats (sic) are the true enemy of our country, our freedoms, our constitution, along with liberal news agency’s (sic), liberal news reporters, much like hitlers(sic) nazis , (sic) time we clean these antiamerican (sic) thugs from office,' he wrote. "Former Scranton Police Chief Dan Duffy said Kessler’s conduct was appalling. "'This is exactly what a law enforcement officer should not be doing out there publicly, especially identifying himself as a law enforcement officer. It`s an embarrassment to us,' said Duffy. "Watch video, uploaded to YouTube: https://www.youtube.com/watch?feature=player_embedded&v=x0Rc8L7ltFw"
It Can't Happen Here? 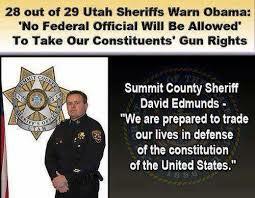 It just did, as a "...one-man police force and his private militia -- accountable not to the local government, but to him -- appear(s) to have taken over the small town of Gilberton" in an act of sedition, and it will happen again and again until the Sheeple awaken and Conservatism is finally criminalized. 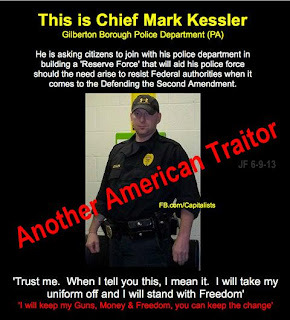 While we have been calling on Congress to investigate the brutal police culture in all of the States and using federal powers to stop the brutality that has been waged by the more corrupt among them, including sending Federal troops if necessary, it is also time to clamp down on the Conservative militias that are backed by Conservative scum like Kessler. intelligence. This explains why we have so many stupid leaders."